5 Is there scientific evidence? 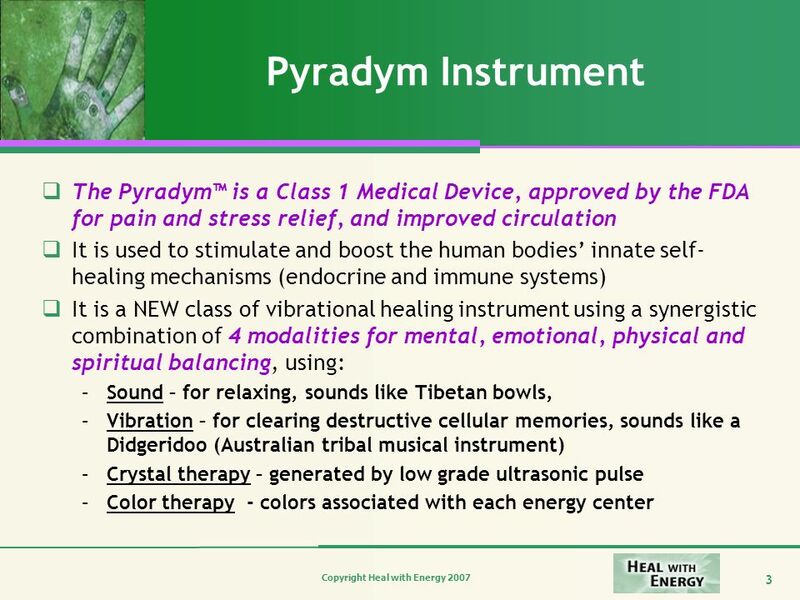 The physioacoustics component has FDA approved claims for pain and stress relief and improved circulation (Class 1 Medical Device, durable medical equipment has CPT codes for insc. billing), Osteoporosis – High frequency, low magnitude stimuli are capable of augmenting bone mass and morphology, improving bone quantity and quality: Department of Biomedical Engineering and Center for Biotechnology, SUNY at Stonybrook, NY, Aug 2000, Physioacoustics componitor generates vibrations within ranges identified. 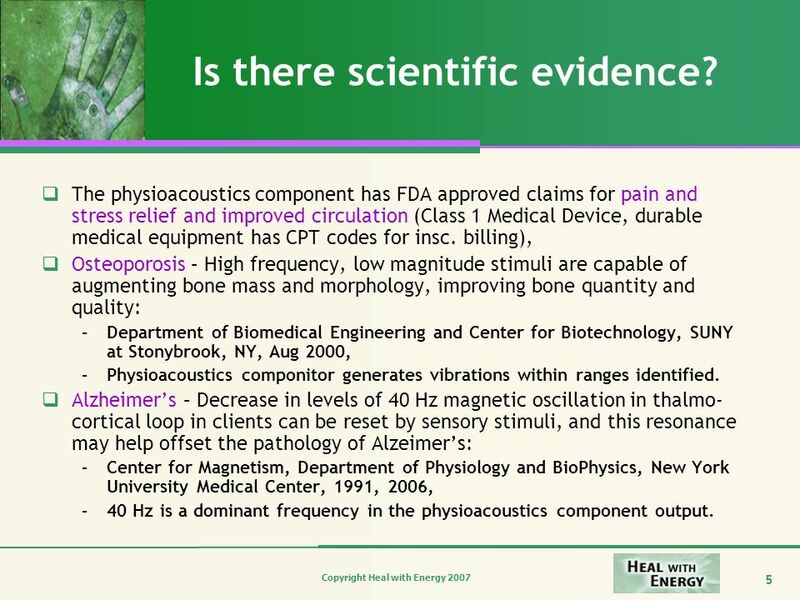 Alzheimer’s – Decrease in levels of 40 Hz magnetic oscillation in thalmo-cortical loop in clients can be reset by sensory stimuli, and this resonance may help offset the pathology of Alzeimer’s: Center for Magnetism, Department of Physiology and BioPhysics, New York University Medical Center, 1991, 2006, 40 Hz is a dominant frequency in the physioacoustics component output. 6 Is there scientific evidence? 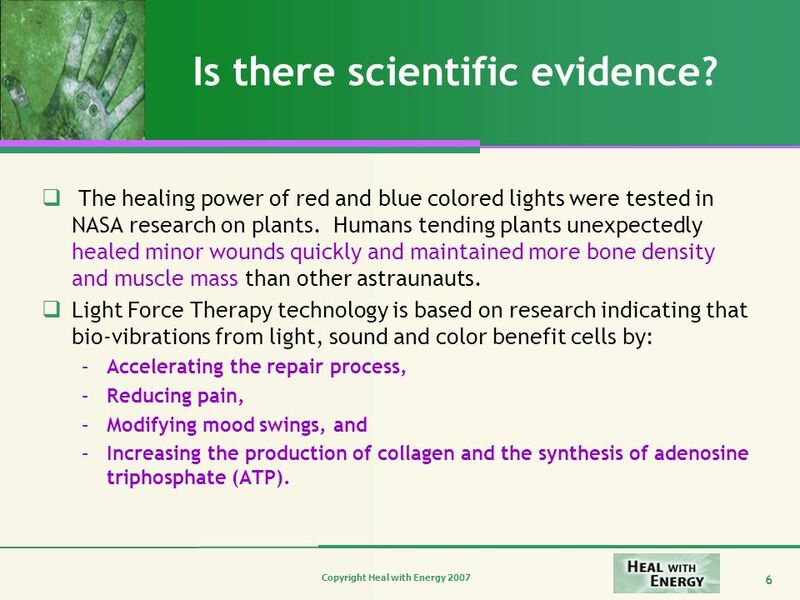 The healing power of red and blue colored lights were tested in NASA research on plants. Humans tending plants unexpectedly healed minor wounds quickly and maintained more bone density and muscle mass than other astraunauts. 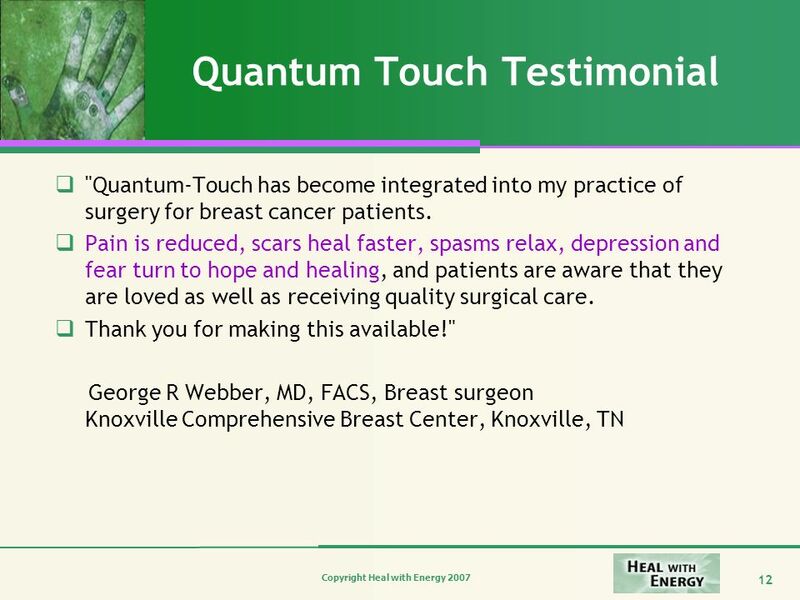 Light Force Therapy technology is based on research indicating that bio-vibrations from light, sound and color benefit cells by: Accelerating the repair process, Reducing pain, Modifying mood swings, and Increasing the production of collagen and the synthesis of adenosine triphosphate (ATP). 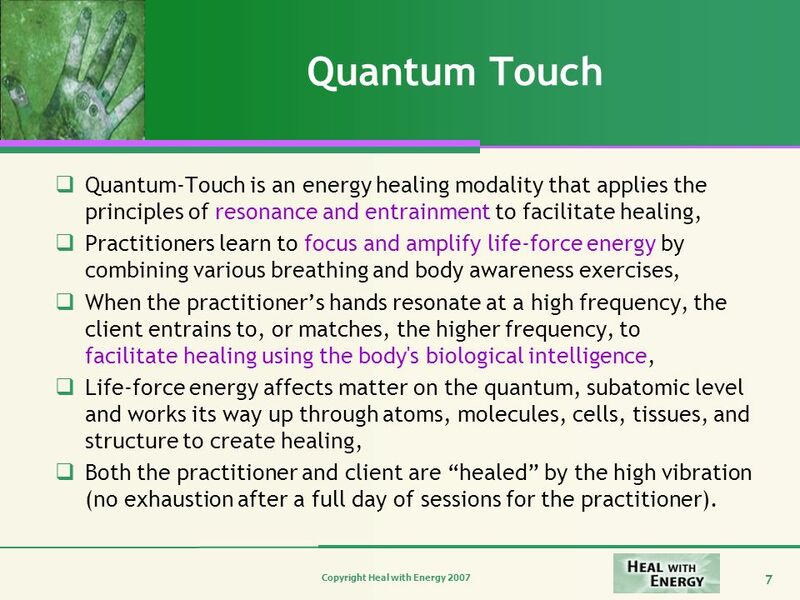 7 Quantum Touch Quantum-Touch is an energy healing modality that applies the principles of resonance and entrainment to facilitate healing, Practitioners learn to focus and amplify life-force energy by combining various breathing and body awareness exercises, When the practitioner’s hands resonate at a high frequency, the client entrains to, or matches, the higher frequency, to facilitate healing using the body's biological intelligence, Life-force energy affects matter on the quantum, subatomic level and works its way up through atoms, molecules, cells, tissues, and structure to create healing, Both the practitioner and client are “healed” by the high vibration (no exhaustion after a full day of sessions for the practitioner). 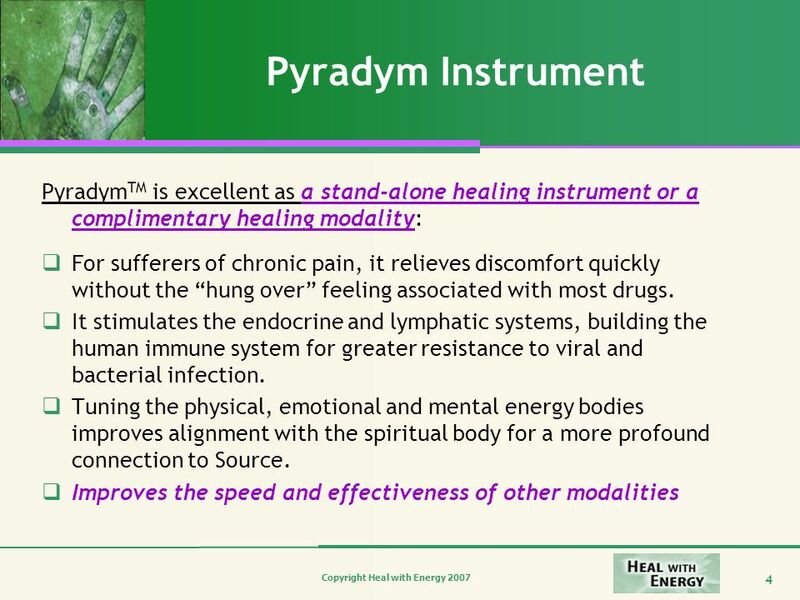 Extremely fast and profound pain relief for a wide range of conditions, Acceleration of the healing process, Spontaneous adjustment of bones into their correct alignment with only a light touch: Even cranial bones will adjust back into alignment, Scoliosis reduced and the spine straightens. 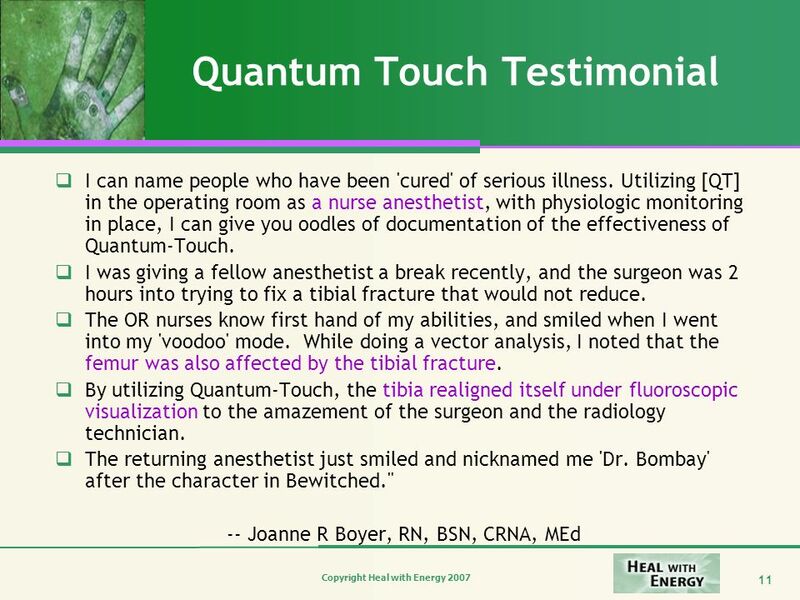 Healing deformed or broken bones, Rapid reduction of inflammation due to injury, Excellent results with babies, animals and people under general anesthesia, Emotional and psychological conditions respond well to Quantum-Touch, Induction of sleep or deep meditation, Distant Healing. 9 Is there scientific evidence? 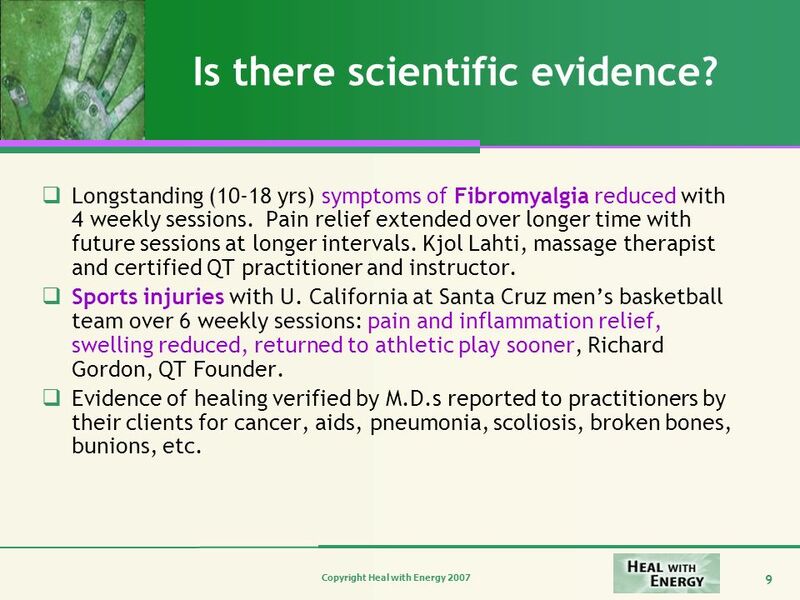 Longstanding (10-18 yrs) symptoms of Fibromyalgia reduced with 4 weekly sessions. Pain relief extended over longer time with future sessions at longer intervals. Kjol Lahti, massage therapist and certified QT practitioner and instructor. Sports injuries with U. California at Santa Cruz men’s basketball team over 6 weekly sessions: pain and inflammation relief, swelling reduced, returned to athletic play sooner, Richard Gordon, QT Founder. 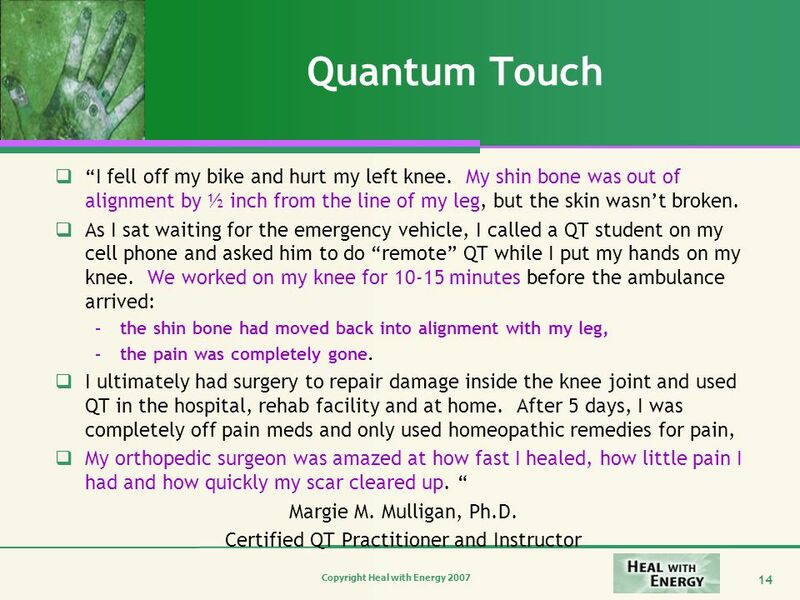 Evidence of healing verified by M.D.s reported to practitioners by their clients for cancer, aids, pneumonia, scoliosis, broken bones, bunions, etc. 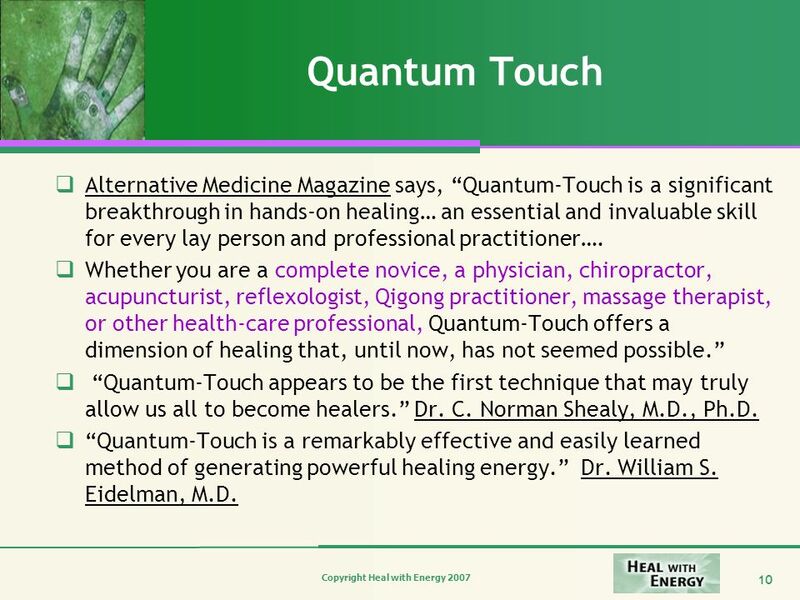 10 Quantum Touch Alternative Medicine Magazine says, “Quantum-Touch is a significant breakthrough in hands-on healing… an essential and invaluable skill for every lay person and professional practitioner…. 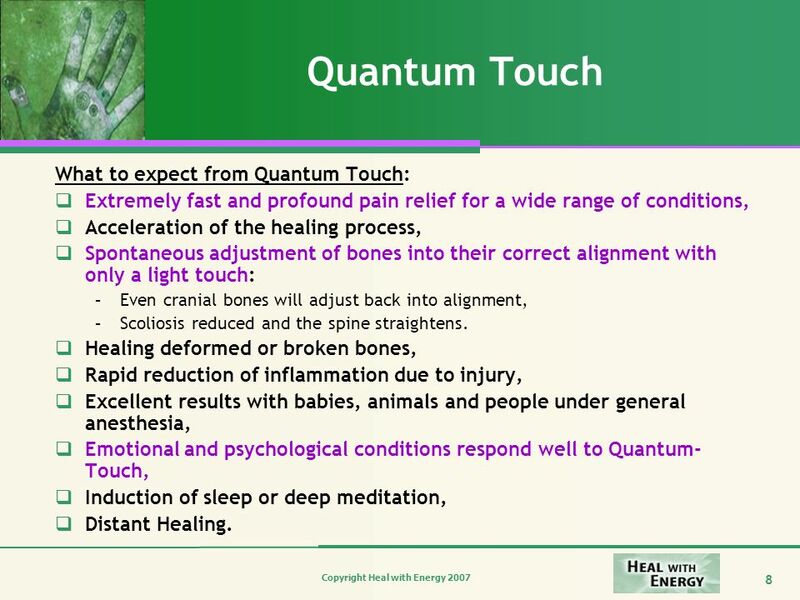 Whether you are a complete novice, a physician, chiropractor, acupuncturist, reflexologist, Qigong practitioner, massage therapist, or other health-care professional, Quantum-Touch offers a dimension of healing that, until now, has not seemed possible.” “Quantum-Touch appears to be the first technique that may truly allow us all to become healers.” Dr. C. Norman Shealy, M.D., Ph.D. “Quantum-Touch is a remarkably effective and easily learned method of generating powerful healing energy.” Dr. William S. Eidelman, M.D. “From the first day I took the Interactive Video course, I was indeed able to move the pelvic and sacral bones of a person standing, with only a light touch on their iliac crests.” “The occiput and spine demonstrated a similar level of response to the process of ’running energy’.” “I was able to produce some remarkable reductions in my patients pain levels for a variety of conditions ranging from the usual neck and back complaints to those of knee, wrist, elbow and temporomandibular joint (TMJ) pain.” Jonathan D. French, D.C. 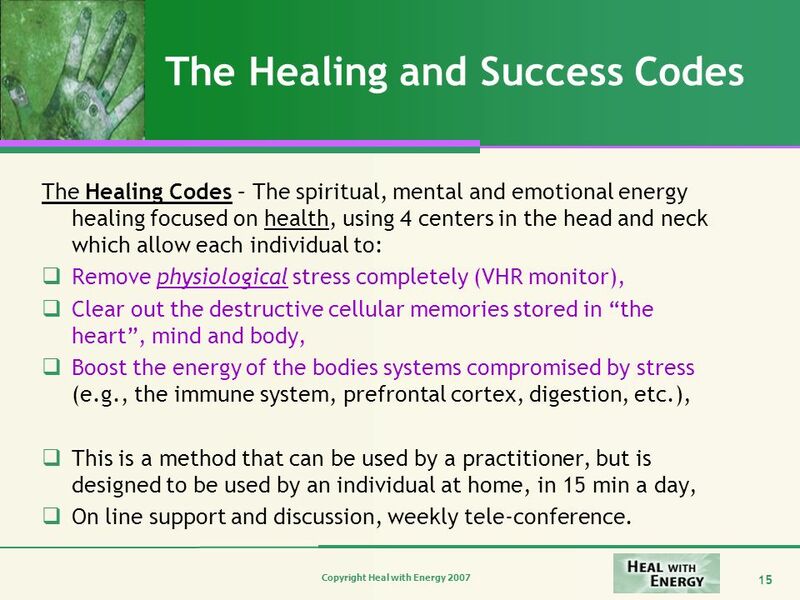 The Healing Codes – The spiritual, mental and emotional energy healing focused on health, using 4 centers in the head and neck which allow each individual to: Remove physiological stress completely (VHR monitor), Clear out the destructive cellular memories stored in “the heart”, mind and body, Boost the energy of the bodies systems compromised by stress (e.g., the immune system, prefrontal cortex, digestion, etc. ), This is a method that can be used by a practitioner, but is designed to be used by an individual at home, in 15 min a day, On line support and discussion, weekly tele-conference. 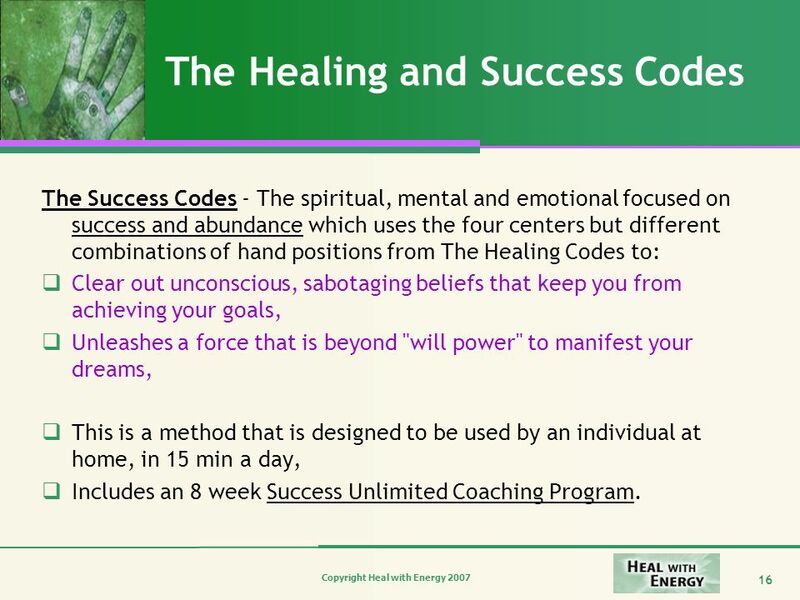 The Success Codes - The spiritual, mental and emotional focused on success and abundance which uses the four centers but different combinations of hand positions from The Healing Codes to: Clear out unconscious, sabotaging beliefs that keep you from achieving your goals, Unleashes a force that is beyond "will power" to manifest your dreams, This is a method that is designed to be used by an individual at home, in 15 min a day, Includes an 8 week Success Unlimited Coaching Program. 17 Is there scientific evidence? 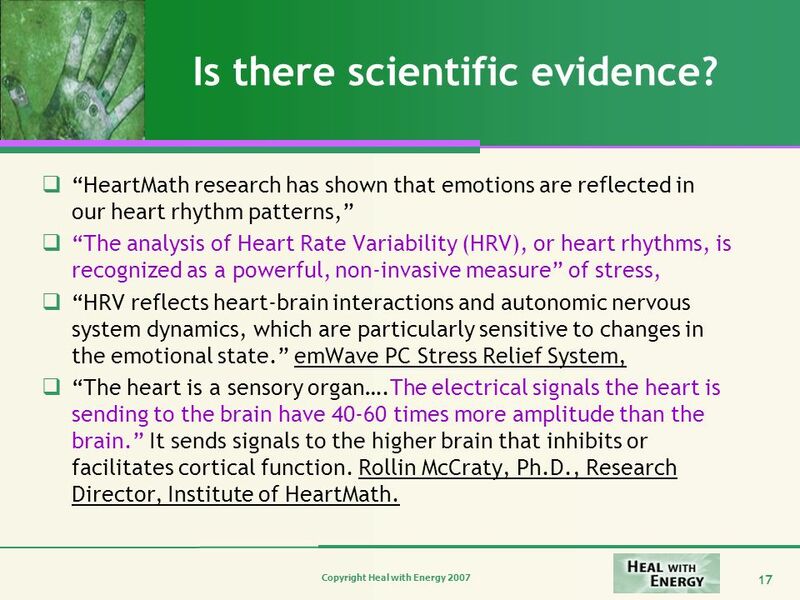 “HeartMath research has shown that emotions are reflected in our heart rhythm patterns,” “The analysis of Heart Rate Variability (HRV), or heart rhythms, is recognized as a powerful, non-invasive measure” of stress, “HRV reflects heart-brain interactions and autonomic nervous system dynamics, which are particularly sensitive to changes in the emotional state.” emWave PC Stress Relief System, “The heart is a sensory organ….The electrical signals the heart is sending to the brain have times more amplitude than the brain.” It sends signals to the higher brain that inhibits or facilitates cortical function. 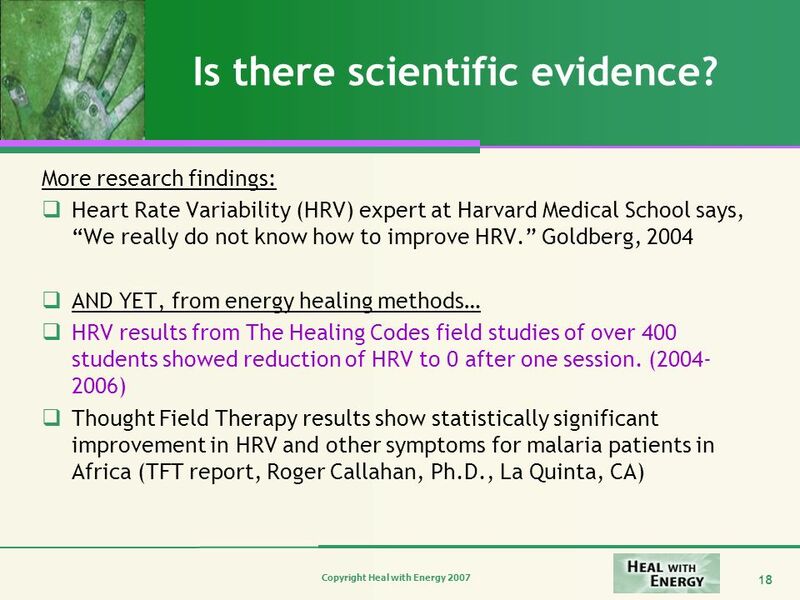 Rollin McCraty, Ph.D., Research Director, Institute of HeartMath. 18 Is there scientific evidence? 19 Is there scientific evidence? Cellular memories appear to be the “healing control mechanism” of every cell in the body. Southwestern University Medical School in a study released Sept 05. “Our best hope for healing incurable illness and disease in the future may very well lie in finding a way to heal cellular memory. “ They studied humans, animals and plants. 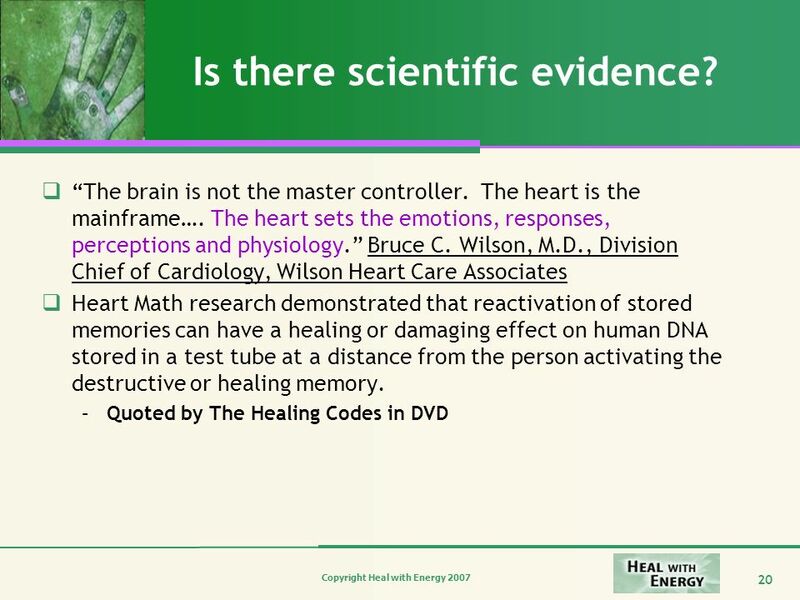 The difference between health and lack of health was the cellular memories of the plant, animal or human. Stanford University Medical School, Bruce Lipton, Ph.D., says everything is caused by stress. 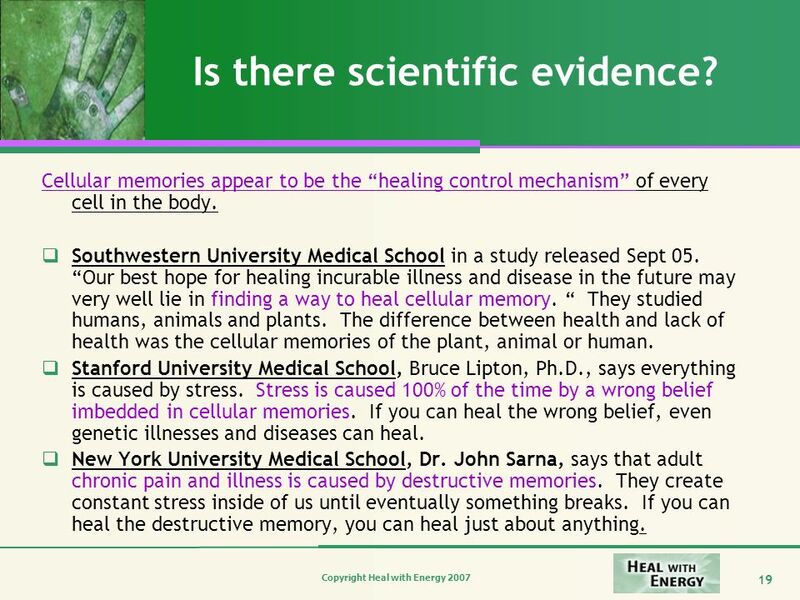 Stress is caused 100% of the time by a wrong belief imbedded in cellular memories. If you can heal the wrong belief, even genetic illnesses and diseases can heal. New York University Medical School, Dr. John Sarna, says that adult chronic pain and illness is caused by destructive memories. They create constant stress inside of us until eventually something breaks. If you can heal the destructive memory, you can heal just about anything. 20 Is there scientific evidence? 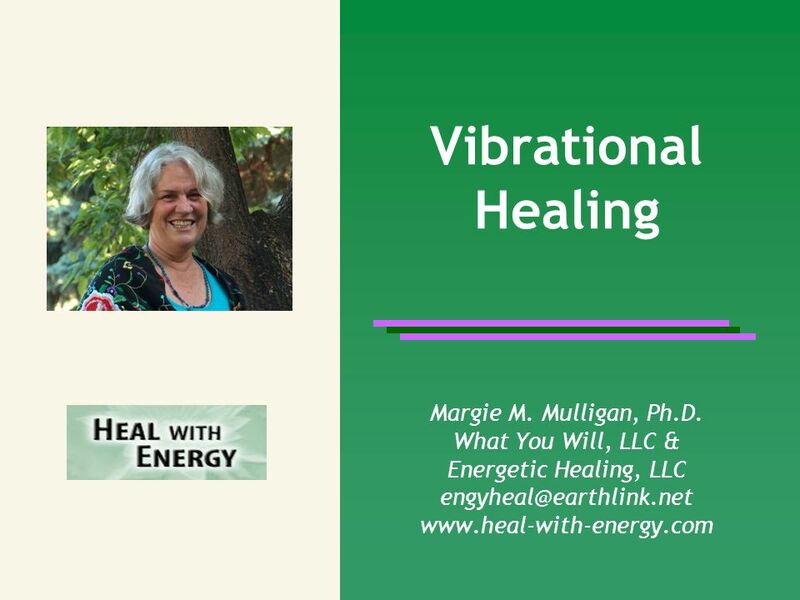 Download ppt "Vibrational Healing Margie M. Mulligan, Ph.D. What You Will, LLC &"
Overview What is iLs? How does iLs work? Chapter 7: Superficial Reflex Techniques Outcome-Based Massage: From Evidence to Practice © 2009 LWW. W ELCOME to Dupont Circle Chiropractic Dr. Robert Feier Palmer Graduate Home of DoctorGoodBack.com. History and Philosophy Chapter 1. Treatment of the mind, body, spirit as a means to treat, prevent and or cure diseases of a chronic multifactoral nature. Copyright 2012 Center For Whole Self Health Stress Management Stress affects people physically, mentally and emotionally. Welcome to the Be Smoke Free Now Program! The Easy, Quick & Comfortable Way to become a NON-SMOKER today and for the rest of your life. MIGRAINES and HEADACHES CAUSES & solutions. CAUSES Kinergetics and RESET help with many of the causes of Migraines: Magnesium deficiency Dehydration TMJ. Sponge: Set up Cornell Notes on pg. 45 Topic: 12.2 Touch: Pain Essential Question: 1. How do viscera (internal organs) respond differently to pain than. 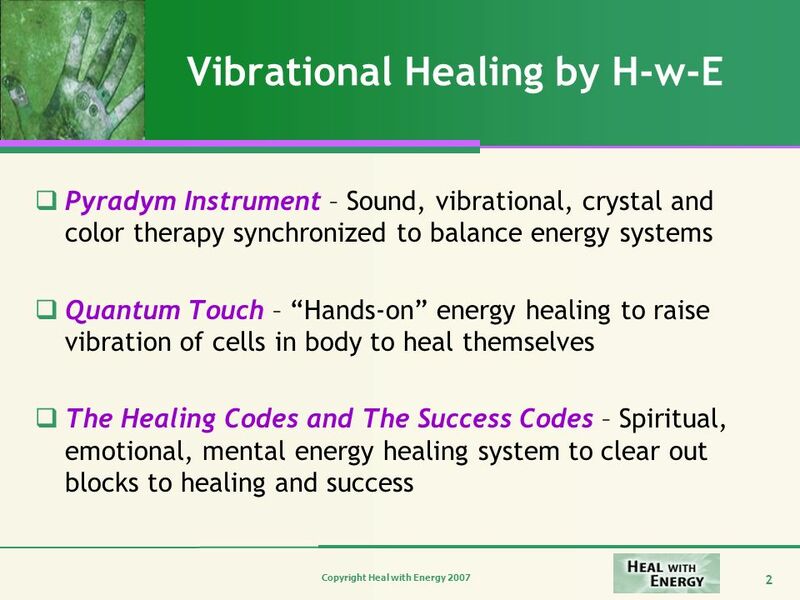 Copyright 2007 Healing Touch Program Introduction to. Chiropractors anchorage Chiropractic therapy can also be used in infants and still produce excellent results. Recently, research was carried out on three.